The role of the shock is primarily to control the oscillations of the suspension via the provision of damping forces. (NOT "dampening"; that's when you wash the shock or when it is raining) Undamped, a sprung suspension will bounce at its natural frequency until frictional forces at the pivot points and internal to the spring finally dissipates the energy contained in the spring. This results in varying forces at the contact patch of the tire (not good for grip) and opens the door for shenanigans as subsequent bumps/dips/turns either reinforce or cancel out the motion of the suspension. A suspension that cycles exactly once in response to a deflection is said to be critically damped. A suspension that cycles twice in response to a deflection (bounce, bounce, stop) is 50% critical, and a suspension that has more damping force than needed to be critical is said to be overdamped. An undamped suspension can be thought of as four pogo sticks in loose formation, bounding around uncontrollably. This is not good for handling. Accordingly, we need some type of device to bleed off the suspension energy in a controlled fashion, so that we get a deflection and extension in reaction to either the road surface (like a bump or hole) or to driver inputs (like a roll and un-roll as the car negotiates a turn) - but nothing more. The shock does this by forcing a viscous fluid (almost always an oil of some sort) through a series of holes or passages. A small hole provides a large restriction, and so produces a large force. A large hole produces a small restriction, and so produces a small force. But any simple hole can only flow so much oil before it effectively shuts off, so a shock consisting of just a piston with some holes in it will produce forces that shoot to infinity as shaft speed increases - and we don't want that. Instead, we want the holes in the piston to change size according to shaft speed - faster speed, larger hole. And if we can control the size of the hole with regard to shaft speed, then we can tailor the forces in such a manner as to produce almost any force/velocity curve we want. 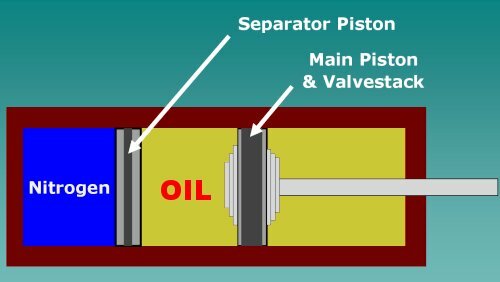 In this cross-section, you can see the holes in the piston that allow oil flow. Each hole is covered by a series of steel discs called the shimstack. These steel discs deflect according to how much force is applied to them, and the amount of deflection controls the size of the hole, and thus, the amount of force produced. Layering different diameters and thicknesses changes the amount of flex in the shimstack, and so changes the size of the hole in relation to the forces applied to it. It is really a very clever system. The holes are angled in such a way that oil is routed to different shimstacks in compression (bump) and extension (rebound) meaning that we can tune bump and rebound forces independently. And by cleverly adding additional small holes that bypass the shimstacks (not shown on this diagram) called bleeds, we can tune forces at very slow shaft velocities. Done properly, the bleed flow will top out just as the shimstack starts to open, and we get a nice, smooth, controlled force curve of whatever shape we want. It turns out that making a good bleed adjuster is very, very difficult. Ideally, you want the amount of force change per twist of the adjustment knob to be the same throughout the range of adjustment. To make that work, the profile of the needle needs to be a very specific shape and held to very, very tight tolerances. Very few shock manufacturers are capable of that kind of quality (as we will see later). The Bilstein "cheesewedge" bleed adjuster used on their PSS9 series shocks is particularly bad. Avoid! 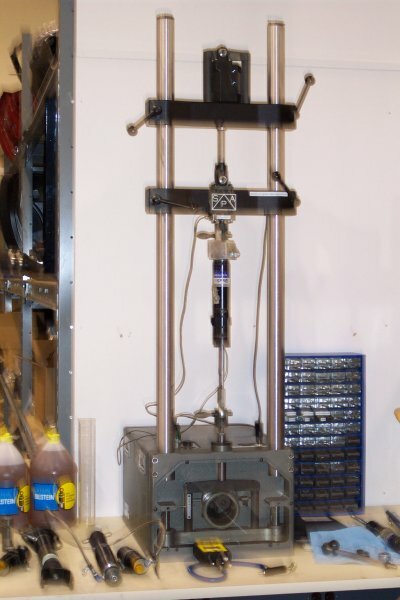 The nitrogen chamber at the bottom of the shock adds height to the shock package. 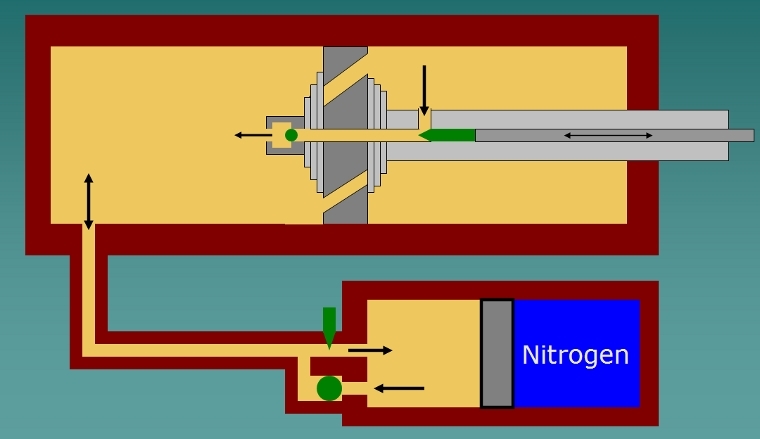 If we want to run the car lower but cannot because the shock piston would impact the separator piston (and we can't get shorter shafts) we can move the nitrogen chamber to a bottle, attached to the shock by a hydraulic line. This also provides an opportunity for another bleed and check valve, making this shock a remote-reservoir, double-adjustable. The manufacturers expend quite a bit of marketing heat and light over the supposed superiority of a twin-tube shock over a monotube and vice versa. I have a slight preference for monotube over twin-tube, based primarily on the simplicity of the monotube, but for the most part, I'm shock-construction-agnostic. It just really doesn't matter all that much. A high-quality twin-tube will trump a crappy monotube every time. Something similar applies to inverted (piston attached to suspension, body attached to chassis) vice non-inverted (piston attached to chassis, body attached to suspension) struts. All else being equal, an inverted strut is better than an non-inverted, due to less unsprung weight and a larger bearing surface to feed side loads through - but all else must be equal before inverted or not becomes significant. Most of the adjusters used on the canisters aren't very good. Anything based on a Fox/Penske 8100 multiple-orifice barrel adjuster has very little control authority and really only at high speed. The Penske 8760 is very good but is megabucks. Unless you really need the extra shock piston clearance inside the shock, and/or you're willing to drop the coin on 8760s, there just isn't that much value to a remote reservoir. Note that I consider knobs on shocks as ways to get the forces to match on the dyno, or to rough in forces while testing; I never, ever, ever muck with the shocks during competition. I've run hundreds of shocks on my shock dyno and the repeatability of shock adjusters is downright horrible on anything except the highest end shocks (and even these have their quirks). When you have the damping right, it's right - unless you do something to change the natural frequency. Changing the shocks to try and change balance is an act of desperation - or of a Stock class car, which has few other options. Let me make this as clear as I possibly can: THE ADJUSTERS ON YOUR SHOCKS ALMOST CERTAINLY DO NOT DO WHAT YOU THINK THEY DO. Unless you have something high-end, like a Penske, and you've taken the time to clock the adjuster window on the shock dyno, the knobs on your shocks cannot be trusted to work. Most shocks of the same model DO NOT match each other on the same adjuster setting, and each click DOES NOT make the same change in force. Most shocks make very large changes per click near the "full hard" setting and make very little to no change near the "full soft" setting. Despite this easily verifiable fact, the Cult of the Adjustable Shock certainly has its adherents. Shocks produce forces on a curve, depending on the piston velocity. There exists an "ideal curve" that is the force curve the shock should provide. But the actual curve the shock produces is something different. As you tune the shock, what you are doing is bringing the actual produced shock force curve closer to the ideal curve - and this has to be done over the entire range of the shock's possible velocities. It is entirely possible to have the shock match the ideal curve well in some places, but not well in others (this is the norm, in fact). Once a shock is matched to the "ideal" curve, it is correct for the entire speed range of inputs - meaning that it never has to be adjusted. Happy Fun Fact: Formula One cars use non-adjustable shocks. They get away with this by running the car on a seven-post shaker rig that plays back suspension movements recorded previously on that track, using the data the collect on the rig to tune the shocks, and once the shocks are tuned, those are the shock forces they use at the race. Once they're right, they're right. OK, so what if they aren't right? Wouldn't it be good to have an adjuster for tuning purposes? Well, yeah, it would be - if the adjuster worked as advertised. In my experience on my shock dyno, most adjusters DO NOT work the way you think they do - in some cases, horrendously. It's like having a blind man adjust the focus on your camera. What's the point? 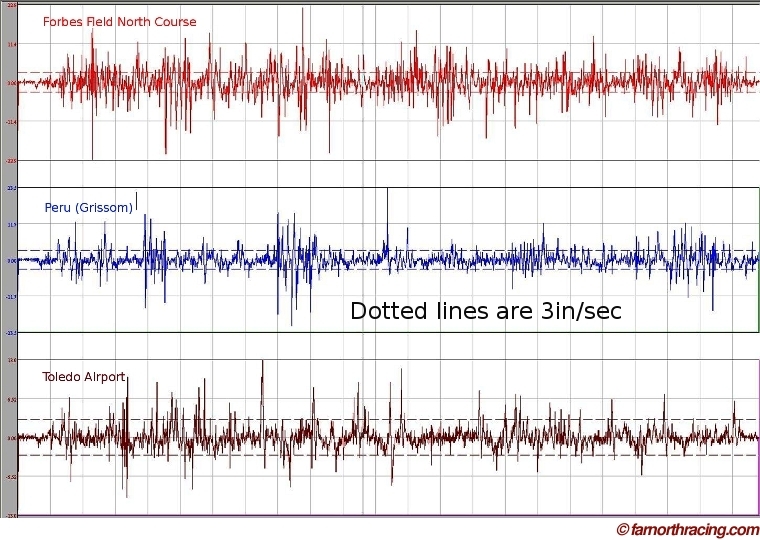 Notice the peak speeds on all three plots, and notice how much time the shocks stay below 3 in/sec. Now think about how useful that high speed adjuster really is. Amongst some people, the hot ticket is to take gas-pressurized shocks, and degass them. The idea being that, with less gas pressure, the car sits a little lower and that lowers the CG height. That's a slow-speed "football" plot of a degassed shock. Yes, you lowered the CG of the car - but the shock stopped working too. 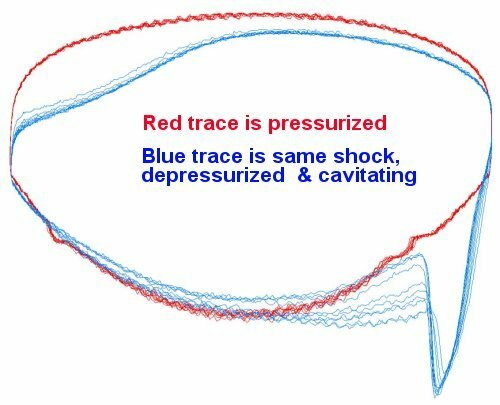 Interestingly, I've started to see/hear pushback from the Cult of the Degassed Shock about this section... that dyno trace is a slow-speed trace from 0-3 in/sec. Those are speeds you will see with chassis movements, not bumps. No matter how smooth your site might be, you're going to see shock speeds in this area, just as the chassis pitches and rolls due to driver inputs. A degassed shock cavitates at a very slow speed, and once it starts cavitating, all kinds of crazy crap starts to happen. Cavitation is Bad. Cavitation is Not Your Friend. Cavitation must be avoided at all costs, damn the ride height and full speed ahead. A slightly taller car with functional shocks will be faster than a low car on cavitating shocks, all else being equal. Of course, all else is rarely equal... which is where we go back to the "people who are fast in spite of their setups, not because of their setups. For a Bilstein, minimum gas pressure before it started cavitating on the low speed trace was about 80 PSI +/- 10 PSI. I ran 125 PSI in mine, and that never cavitated. Some feedback on what constitutes "crap" - it seems I may have gored a few sacred cows. That's not at all surprising, given the amount of disinformation and myth accepted as common sense when it comes to shocks. So then, why "not on this list, almost certainly crap"? Because the amount of crap I found on the dyno is simply staggering. It was INSANE just how much blatant, evil-wrong stuff I found running shocks on the dyno. Stuff that I had always considered decent based on reputation and referral turned out to be crap once tested. With that track record, any given shock is more likely to be crap than not - especially if the shock supplier can not or will not provide an individual dyno trace for each shock he sells you. If he can not (because he doesn't have a dyno) then HE has no idea what the shock is doing either, and if he will not (he dynoed it but won't give you the data) then he is hiding something and should not be delt with. My experience with shock builders who have Secret Squirrel valvings is that they DO have something to hide - the fact that they do crappy work. Insist on dyno plots! A rebound adjuster should only adjust rebound and a compression adjuster should only adjust compression. A small amount of crosstalk is acceptable (a couple of percent) because building truly independent adjusters turns out to be trickier than it sounds, but if a "rebound" adjustment makes a similar or greater (!) change to compression (or vice versa) then it is "crap". Koni Yellows pass this test; all the ones I dynoed (that weren't obviously dead) are pretty good about rebound-only with little to no crosstalk. Any adjuster, when adjusted "harder" or "softer" should actually go in the correct direction. If you move the adjuster "harder" and the shock gets "softer" (or vice versa) - crap. Again, Konis pass this test. The adjuster should be as linear as possible, meaning that the force change per click should be equal throughout the adjustment range. This turns out to be REALLY difficult to do, and even the best shocks struggle to pass this test - particularly on the "full soft" portion of the range. When you understand how the adjusters work, this makes total sense - if, for example, you are dealing with a low-speed bleed adjuster, once you have reached the flow limit of the bypass passage no amount of "softer" on the adjuster will have any effect. So I'm willing to apply a little common sense here: nonlinearity at the extremes of the adjuster is OK as long as there is SOME portion of the range that is linear. Konis usually pass this, with the caveat that the last half-turn before full hard is usually VERY nonlinear (with very small adjustments making very large force changes) and the last half-to-full turn before full soft usually doesn't do very much. Adjusters should be repeatable, meaning, if I set the shock to a particular setting, it should produce a particular force, within a couple of percent. Some shocks care about which direction you come from, such that the shock will produce a different force depending on if you got there by softening or stiffening (most of the time, this was hysteresis in the adjuster detent - Bilstein PSS9) and that is OK as long as it is repeatable. Any shock with a non-detented adjuster (meaning no "clicks" but instead a smooth knob) is going to struggle on this test, more so depending on how sensitive the adjuster is. The Penske rebound adjuster can be made nearly perfect by matching the shocks and then clocking the adjuster window. Konis wind up eyeballing the knob, and the maximum realistic resolution is 1/8 turn. Depending on where you are on the adjustment range linearity, this may or may not be good enough. If you have a set of the Koni "compress and twist to adjust" shocks - good luck! For most people, assuming you have dyno-matched shocks, you can get away with this on a Koni Yellow. It's not perfect; it's not as good as Penske, but it is close enough for government work. But any shock where the adjuster is a random force generator == crap. Any two shocks with the same valving should produce the same force. Bilsteins are EXCELLENT at this, almost (almost!) to the point where you don't need to dyno them after assembly (almost! - I have caught my own assembly errors by religiously dynoing everything after assembly) Anything with an adjuster is going to struggle a little bit here, based on tolerances within the adjuster. Penskes can usually be set this way by matching and clocking the adjuster. Koni Yellows have to be bought in batches and then matched - and YES, there IS enough variation in off-the-shelf Yellows to make this necessary. Shocks where the force curves will vary wildly shock-to-shock with the same part number == crap. The shocks should be fade resistant enough to survive AT LEAST my dyno sweep. My dyno program (SPA BTP-2000 Dyno 6.1) ran 10 cycles at 3in/sec peak speed (I could go faster, but rarely did, as the interesting stuff is sub-3 in/sec) and then averaged the runs. Looking at the individual runs, they should be mostly on top of each other and with reasonable hysteresis. Each run getting progressively softer is a sure sign of fade. If I do a full rebound sweep and go back to the start as a confirmation, that value should be identical as when I started, within a couple of percent. Koni==good. Bilstein==good. Penske==good. Japanese==crap. Note that NONE of these criteria talk about the shape or the amount of the force curve - that I consider as a "configuration" issue and is up to the engineer. Any given off the shelf force curve may or may not match a given instance of a car, but matching or not matching off the shelf is NOT an indication of quality or crap. That is, of course, contingent on rebuilding/revalving services being available - if you cannot revalve the shock for love or money, then an crappy off the shelf force curve (Japanese stuff again) makes for a crappy shock. I like Konis Yellows quite a bit - well enough to sell them, when that's what I was doing. They have their foibles, but they are really very good for the price, and there are workarounds for the foibles. If you absolutely MUST have a knob, and you cannot afford Penskes, then they are really the only choice. The biggest downside to a Koni Yellow - not user serviceable, meaning that you are not Master of your Own Domain when it comes to revalves. This is a big enough PITA that I think you're better off forgoing the knob and going with a Bilstein, where you can field-revalve in minutes. The other bit of pushback I get on "crap" all the time is: "If you know which shocks are crappy and which rebuilders do shoddy work, why not tell us"? And the simple answer is: litigation. I get enough nasty letters from people as it is without specifying brands and people by name. Sometimes, it seems like the truth is not necessarily enough protection to prevent people from just suing if you post data that is not flattering to their product. I'm dancing close enough to the edge as it is. I wish this wasn't the case. I wish I could come out and just say who the worst offenders really are. But I can't. So I talk about the good stuff instead. Caveat emptor! Stray from the "not crap" list at your peril! And if you really, really must have one of those shiny green or purple shocks, DYNO IT BEFORE INSTALLING IT ON YOUR CAR.